It always seems like Hollywood never wants to blame anyone for anything, but then again, no one wants to watch a movie that’s going to make them feel guilty. This is usually the case with films that try to deal with race, as if enacting some type of fantasy world in which justice is served, practical equality achieved, and the color line eliminated makes up for Mammy. After years of apologizing, can’t we just move on and stop talking about race? As The Butler so kindly reminded us, we’re basically a post-racial society now that we’ve elected a black president. Django gets the girl and his revenge, remember? But Solomon Northrup isn’t Django, and 12 Years a Slave is as far from the norm as a Hollywood film about race will probably ever get. Based on the true narrative of a free man tricked and sold into slavery, 12 Years a Slave distinguishes itself solely through its commitment to a type of historical and visual realism often overlooked by films that pull for an inspirational depiction of slavery. Violence and pain are endemic to slavery, and they rightfully become visual and thematic motifs. But they’re also key aspects of Steve McQueen’s aesthetic, and the distance between an activist realism and a genuine visual delight in the physical suffering of its protagonists is occasionally small enough to cultivate a sense of discomfort that moves beyond necessity. McQueen’s obsessive use of long takes becomes critical to establishing a point, if not multiple points, about the nature of slavery. There’s the horror of watching Solomon (Chiwetel Ejiofor) try to gain traction on muddy ground as he’s hanging by his neck after a botched lynching, but there’s also the added shock of watching other slaves slowly leave their shacks in the background and go about their everyday business, refusing to compromise their already unstable safety by cutting him down. It’s roughly at this point in the film that Solomon accepts tolerance as necessary for survival, something that comes hard for a man who is used to asserting his will and who takes pride in his dignity, a transition that coincides with his being sold to Edwin Epps (Michael Fassbender). The film builds to Epps and his equally maniacal wife Mary (Sarah Paulson), each white character, barring the condescendingly benevolent William Ford (Benedict Cumberbatch), becoming significantly more vicious as Solomon passes through hands. While Epps is prone to the violence of a predictably unpredictable drunk, Mary lashes out in short bursts at Patsey (Lupita Nyong’o), whose only crime seems to be being the subject of her master’s affections. By this point, the prolonged whippings and beatings have gone from being alien to being disgustingly familiar, and Mary’s jealousy, the way she can pick up a glass decanter, hurl it at Patsey’s head, and do roughly the same amount of damage in five seconds, keeps the violence shocking. While the film is strong overall, it takes time for McQueen to develop a visual and narrative consistency, with the first third featuring some awkward CGI and a revolving door of one-note characters. Sean Bobbitt’s cinematography can be flat at times; particularly in short, exterior scenes that serve a small purpose and lack the contrast and depth of a majority of the film. Hans Zimmer’s score occasionally rubs against McQueen’s unobtrusive style, but it never becomes intolerable. 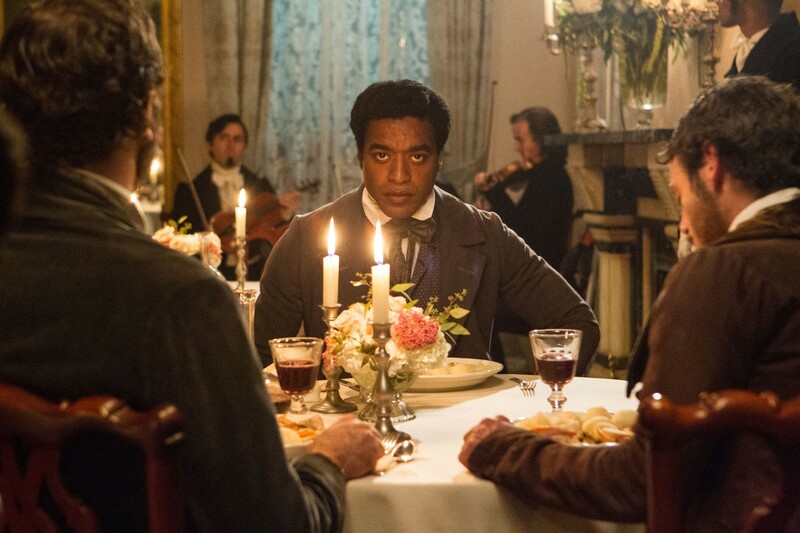 12 Years a Slave succeeds in cultivating the discomfort necessary for taking its own subject matter seriously. It is the revulsion you experience while watching other people being treated like animals that is key to 12 Years a Slave’s success: it never condescends to its characters or audience, never assumes that we don’t understand that the people being beaten are human beings. Despite a frustratingly unnecessary exchange between a Canadian carpenter (Brad Pitt) and Epps in which the carpenter elucidates the nuances of human equality for a predictably unreceptive Epps, the film never attempts to justify Solomon, Patsey, and the other slaves’ awareness of the injustice of slavery, their cognizance of the discrepancies between how they are being treated and how they should be treated. It assumes that we – the audience, its characters – have accepted liberal equality, and 12 Years a Slave’s most biting critique is of the ways in which believing in the redemptive nature of true liberalism only serves to perpetuate systems of exclusion and inegalitarianism. Not many characters in the film are willing to risk their own safety or comfort to help others, whether it’s Ford deliberately silencing Solomon’s story of his past or, to some extent, Brad Pitt’s carpenter hesitating more than someone who has just preached the gospel of equality should when Solomon asks him to send a letter to his family in Saratoga. For the white characters in the film, as with the majority of films that attempt to incorporate race and racial themes in a meaningful way, equality works as much as it serves their interests. McQueen approaches equality with an understanding of how practice hasn’t matched up to theory; to do that, he can’t operate under the assumption that any of his characters lack a fundamental human equality. While 12 Years a Slave still functions along a color line that divides its characters up into two categories based on race, it does so consciously and primarily because of its subject matter; it can’t engage with slavery using familiar cinematic tropes and claim anything resembling historical accuracy. It’s probably one of the few films poised to actually engage in the racial discourse in an intelligent way, and as such, it’s something of a paradigm shift. Written by: Olivia Domba on October 26, 2013. Last revised by: Double Exposure, our reviewer, on November 5, 2013.